I wanted to pass along the news of the passing of one of our very sweet sanctuary bunnies named Magenta---after one of my favorite colors. Magenta came to SaveABunny a few years ago after experiencing brain damage after her spay---possibly from accidental oxygen deprivation. She lived a good life here for many years with her bunny buddies Grace, Scooter and Emerald and was very connected to Rob and me. In the past few weeks she was injured and likely had brain trauma. She never recovered. Francesca was kind and generous to get her the extra healing help she needed and Rob and I closely monitored her quality of life. We worked daily with her "spiritual" energy and allowed her to make the choice when she wanted to leave her body. We also touched base with an animal communicator to make sure we were being respectful of Magenta's wishes. Tonight she declined significantly and Rob did a shamanic journey to show her the way if she was ready to leave. It is incredibly hard to accept that they will leave us. Not long afterwards she died naturally in Rob's and my arms being while told how much she was loved and incredibly special she was to us. Grace, Scooter and Emerald were able to say goodbye. All of us felt a huge loss for such a special, "pure" and loving bunny. If you never met Magenta you missed meeting one of the most loving, pure and sweet bunnies ever had the pleasure of living with and honored with her wisdom and heart. 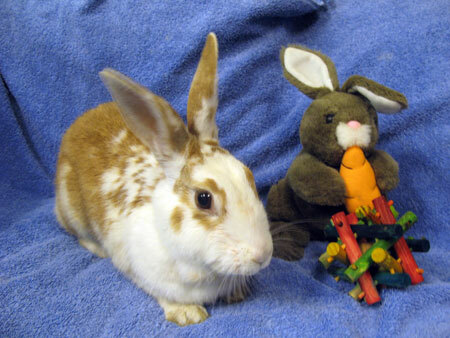 I am now a sanctuary rabbit here at SaveABunny and live with Scooter, Grace and Emerald! Hi. My name is Magenta. I have been told that I am a very sweet and pretty girl. My life has changed dramatically in the past few weeks and I am still adapting. I am grateful for the love and care I am getting at SaveABunny. It appears that during my spay surgery I had some oxygen deprivation. It caused me to lose my sight and I also have some other neurological issues. I am being monitored with the hope that with time my brain will able to heal itself. Complications like mine are rare and the risk of a rabbit dying young from cancer(80%) if not spayed is higher than the surgical risks of a spay. I am especially comforted by being talked with and have a special connection with Marcy, the SaveABunny founder. I reached out and bonded with her when I first met her at the shelter before my spay surgery. I think it was meant to be that I come to SaveABunny, though I wish I was fully healthy. I'm trying very hard to become a permanent resident at SaveABunny by being snuggly and endearing, but I know the rules. Space is limited and if an amazing home for me becomes available I should take it. In the meantime, I am learning to be a sightless bunny and enjoy a different, though special life with its new challenges. Please visit me soon and wish me well on my journey.